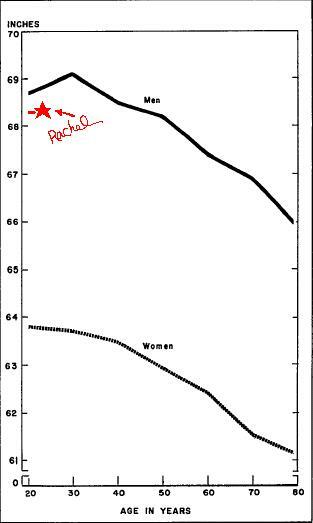 Raging, Ranting, Raving, and Rhapsodizing: Shocking new study reveals that "9 out of 10 women are shorter than Rachel"
Shocking new study reveals that "9 out of 10 women are shorter than Rachel"
I've never thought of myself as tall. I've always seen myself as average height, on account of the "tall gene" being in my family, and most of my aunts, uncles, cousins, both my parents, and one set of grandparents are almost 6 feet tall, or taller. Needless to say, I'm actually a little short in my family. I've never thought much about my height. That was until I met Stephen's mom, who is hilarious without meaning to be, can comfortably sustain a conversation virtually without external input for at least an hour (very nice when you are too exhausted to utter intelligible sounds but don't want to be rude), and is quite short indeed. I now see where Stephen gets many of the qualities I adore about him, and few that I don't so much. :) I began to wonder how the two of them can conduct a productive verbal exchange, as they both consistently interrupt the other, often to interject completely off-topic subjects and leave the old subject behind in order to discuss this new topic (this pattern repeats itself seamlessly...). Although, I have often marveled at Stephen's ability to come back to something we were discussing or a story he was telling as much as 3 hours ago, and pick it back up where he left off as if no time had passed at all. It must come from growing up talking to his mom (they're really fun together, actually). ANYWAaAaAaAaAaAaY (speaking of tangents), I was talking about being tall. I felt like some kind of hulking behemoth next to this woman. She's tiny! Not just short, but little. Walking with her and Stephen, I started to develop this mental image of a sweet, petite woman walking in between a normal sized man and a lumbering one eyed giant. People have been telling me for years that I'm tall, and it just never clicked till now. This new discovery, along with the fact that my boyfriend is only an inch taller than me, is the perfect excuse to never, EVER have to wear heels again. Anyway, put me in 3-inch pumps and I become a lawsuit waiting to happen, clumsily walking about downtown Denver amidst the bustling dwarfish masses (and that's without the inebriation factor... I'm 21 now!). 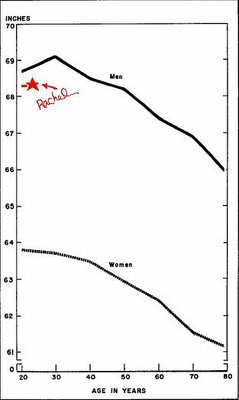 By the way, this chart came from the National Center for Health Statistics. It's REAL except for my addition (in red). In any case, I certainly view my weight a little differently now. I've always been a little (not much!) heavier than the average woman... but if you take into account the fact that I'm half a foot taller than the average woman, I come out just right. Birthday Update: I DID receive flowers from my mom (so sweet!!! thank you! ), and I got some really fantastic presents that I didn't expect and for which I am very, very grateful. My parents got me an iPOD nano (I could look it up and see the price but I'm afraid to), so now I can "shut the world out completely". My sister got me a gorgeous embossed journal which I'm fond of declaring is "genuINE dead cow", and she did a very pretty still-life sketch of a wine bottle and glass. Stephen got me really nice snowboarding boots which I'm dying to use, and he took me out for a glass (which is to say bottle) of wine. That was after my Dad and I split a little bottle of sake at the restaurant where we ate... I was extra loud and laughy that night, but responsibly so, in my expert opinion. Wish I could borrow a couple of those inches. I just grew to 5'1'' this year, and I think I might still be growing. I lost my last baby tooth when I was 15, so my growth has been a little slow. I have the opposite feeling you do in public. I feel like everyone else is towering over me! I've been about this tall since I was 13 or 14, and I was a VERY late bloomer. Sometimes I wish I could give some of my inches away. It would be nice to be a short, cute, approachable girl instead of a tall, intimidating woman with a "damn impressive handshake"*. *I was actually told this once by an older man. He sure was a lady charmer. Dude... this is halarious. I am one of those women shorter than you. LOL! I love it! You are so witty and creative. More Lord!